I’m Oliver Joyce, game developer at Whiskeybarrel Studios and sometimes contributor to Indie Game Buzz. Many of you may remember the popular web game series Swords and Sandals – in short, it was a light hearted turn-based gladiator RPG. 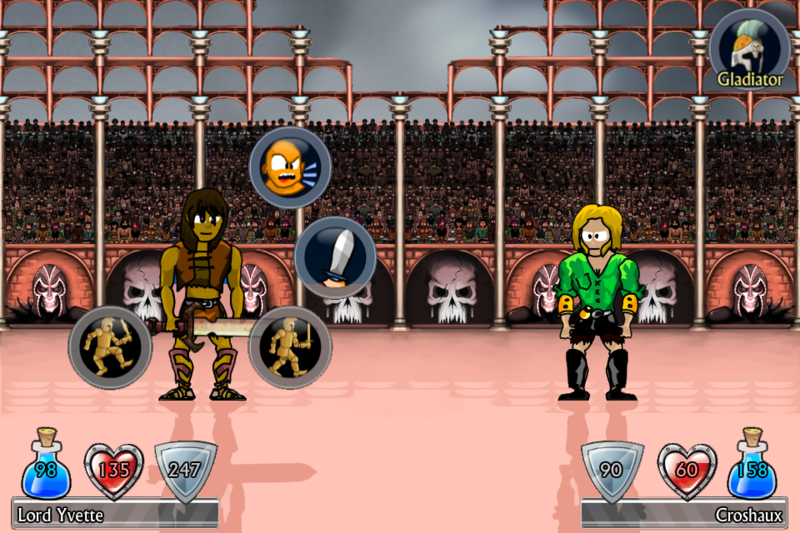 Two cartoon gladiators would duke it out in an arena, the winner could upgrade their weapons, armour etc, compete in tournaments and fight various arena bosses. It turned out to be a huge success, spawning 4 sequels ( of varying quality!!!) and was played hundreds of millions of times across various Flash game portals and as a mobile app. Still an obscure title in the scheme of things, but popular enough to have a bit of a cult following. Anyway, long story short – these games were all built when I was working for a very small Australian game development company. I’d come up with the Swords and Sandals concept many years ago, but unfortunately I was naive when I joined the company as a relative youngster and along the way I lost the rights to the brand unknowingly. This can be a real kick in the teeth for something you hold dear to your heart and is a great lesson to any new and upcoming devs – HOLD ONTO YOUR IP! Don’t let others take it , much of the time they do not have your best interests at heart. Anyway, eventually, the Swords and Sandals game building era came to an end and the company and I parted ways. As a result, there was no real way for me to make any more Swords and Sandals themed games. They owned the name, but in essence, S&S was me – nobody there could build the games from a creative standpoint and we were at a real impasse. I was frustrated with the lack of care/interest given to what had once been a popular series, and for a long time I thought that was the end of things. Such is the way of the world. Fortunately for me, last year a shining light appeared in the form of eGames.com LLC. The US based publisher bought the rights to the series and I’ve now got a deal to remake a few of them and potentially even create a few new ones. They genuinely care about the brand and have been a huge support in getting it off the ground again. Thanks to the eGames.com LLC deal, there will be at least three more Swords and Sandals games to come in the next year, as well as potentially a few other great games. 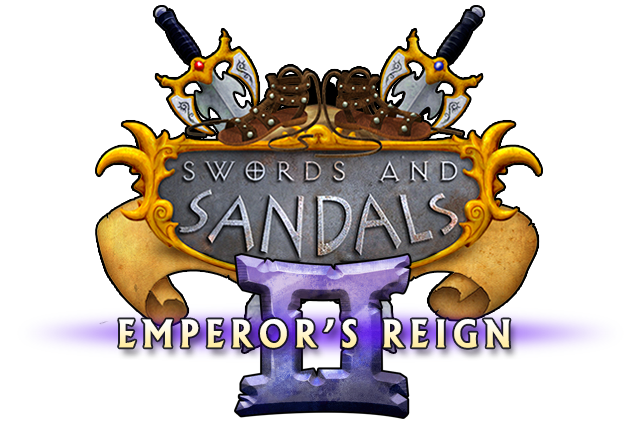 By far the most popular game in the series was Swords and Sandals 2: Emperor’s Reign , and that’s a game I’ve long wanted to port to mobile. The game code was nearly 10 years old, so it required a total rebuild. Originally being built in Flash ActionScript 2, I decided to build the game using Adobe AIR and the Starling Framework in order to keep the look and feel of the game similar. Starling’s very powerful for 2D games and allows me to use all the original animations , but have the game running across the web, desktop and of course mobile versions. Earlier this year, I made You Are A Knight, a similar game to Swords and Sandals – I even billed it as a ‘spiritual sequel’. Because the two games were so similar, I decided I’d use YAAK’s engine to build the new S&S games – which in theory is great because it means you don’t have to recode all the ‘character sheet’, ‘level up’ , ‘town’ screens etc. However, in reality I’ve found it has its own complexities because not everything can be converted so easily – YAAK has some stats that behave totally differently to S&S and vice versa. To complicate things further, I’ve been building both Swords and Sandals II and Swords and Sandals V at the same time – both using the same basic engine , but one has a dungeon crawler. So I’m sifting through a bunch of different code-bases and trying to extract old bits of code, combining various libraries etc. In essence, I’m building a game using 3 different (yet similar!) codebases. It’s like chucking together three lego sets without instructions and trying to rebuild a fourth lego set you saw once in a photo. Not the way I’d recommend new starters to game development to work, but since I’ve been building S&S games for a decade now I’m making it work. Swords and Sandals 2 Redux ( as I’m calling it for now!) is pretty far along in development. I’ve got a fully working intro, character creator, town, shopping system and pre-post battle screens. The combat is starting to come together but this is by far the trickiest part. I’m overhauling the particle effects system and making the combat snappier and faster than ever before, as well as giving the character armour sets a bit of a fresh overhaul to make them feel more ‘roman gladiator’ than ‘medieval knight’. Things like removing a heavy chain coif helmet and replacing it with a more traditional ‘gladiator helm’, or adding more sandals and less leather boots in order to keep the spirit of the game. It’s a bit of a spinout working on a game you first built a decade ago. Much has changed, but much is the same – the way you code improves, but I can still understand what I was building back then, and many of the algorithms just plug right in and work. The combat animations from so long ago still hold up – they’re cartoony but have a unique visual style. I’m adding more depth to the combat engine while trying to retain the game’s approachable simplicity … a delicate task. I’m trying to lose features that were popular in the past but aren’t so relevant in a modern game ( especially for mobile etc). I’m really hoping that the end result lives up to the original games in a way that the first mobile game did not – I hated that version and have always wanted to have another crack at it. Development has been slow on this as I’m building it at night and on weekends, but slowly slowly the game is forming into something recognisable and, more importantly, playable! 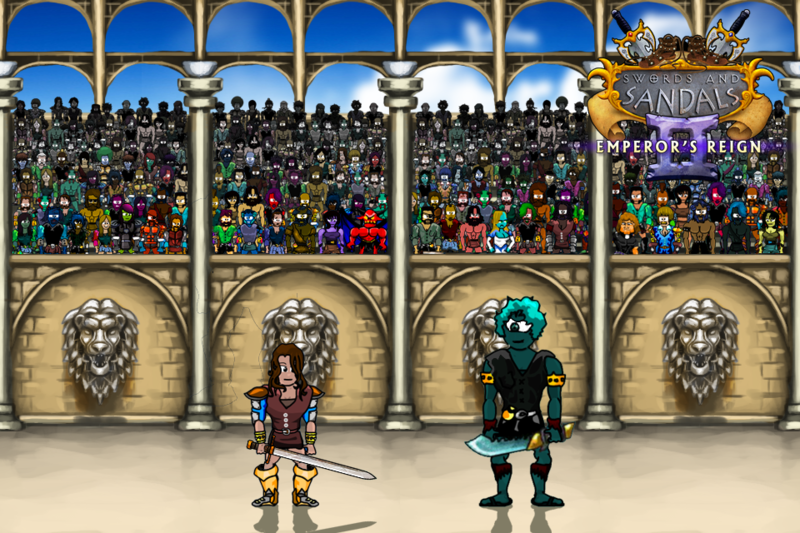 Swords and Sandals 2 Redux will be out later this year initially for iOS and Android, but later on for PC on Steam. Looking forward to sharing a preview build here closer to release. If you’re interested in following the game’s progress ( or were a fan of the series and just want to chat about it) , you can get in touch with me via Twitter at @oliver_joyce. I always love interacting with fans, other gamedevs and interested games media people.